I'm not in with the in crowd who thinks that, almost by definition, sequels are inferior to their precursors, partially because I didn't pick up my ideas about criticism from the Scream films. But I think it's worth commenting how much more I liked Aliens than their mother Alien. While I don't think the sequelitis syndrome has merit, I also don't routinely find sequels an improvement by more than a couple points. In this case I did, and only a few surface flaws-a touch of stereotype here, a bit of a hammy performance there (mainly Private Vasquez and the cigar-chomping Marine squadron leader)-disabled me from giving Aliens a perfect score, which I felt it should have earned. Yes, the first film has its charm, and it certainly has its supporters. Unfortunately, I think it is also very overrated, and the supporters ignore that it's just as slow, has just as many implausibilities, just as many dubious performances, and embraces just as many stereotypes as the films they stand in line to hate, Alien sequels or not. 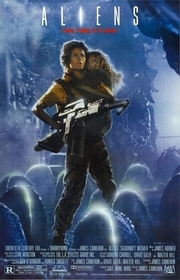 Aliens has some of those problems, as I mentioned, but it's such an intense, gripping work of cinematic breadth and power that it overcomes its surface flaws like a spectacular, physics-defying roller coaster that just happens to be painted with pink polka dots and loaded with speakers blasting pan flute music. Director and scripter James (The Terminator, True Lies, Titanic) Cameron wanted to call this film Terror. No, just joking. What I meant to say was that he met the challenge of following up an incredibly popular film in a somewhat novel way. Realizing many of the criticisms stemming from conventional wisdom that are usually raised against sequels, he met all the possible objections he could think of, then turned around and made the film in his own way, as if he was creating the original instead of the offspring, and ended up with a film much better than its progenitor. That is, he set the film in the same universe so that Aliens opens right where Alien stopped. He made sure to not forget any elements from the first to an extent where it seems like the objects that were used to compose the first, but not the composition itself, were cut up, shuffled in a hat, and pulled out at random to ensure that no one could say, "Yeah, but the first film had element x, and that's what is sorely lacking in Aliens." At the same time Cameron extended all of the elements, improved upon most of them (the only two things I would say weren't improved upon are H. R. Giger's art design, but most of it is just incorporated instead, and the original film's score, but that was so badly butchered in the final cut that it doesn't really count), and cut out most of the problems (pacing, sterility, incongruities, etc.) of the first. Even Sigourney Weaver's performance is much improved here, and I like the rest of the cast better, as well (including Lance Henriksen, one of my favorite genre actors, who easily outdoes Ian Holm's Ash). Aliens takes place 57 years after the first film. At the end of the first, Ripley has just closed herself in her "extended sleep" chamber. At the beginning of Aliens, we see a great pan across the interior of her "lifeboat" ship, the Narcissus, that is a direct quote of the beginning of Alien. It gives the series consistency and continuity, but already suggests Cameron's extension of the first film in the set design, cinematography, etc. In fact, a number of such direct quotes are sprinkled throughout Aliens. One of my favorites, and one of the most subtle, was the pan across the sub-ship bay of the marine spacecraft, where we see chains dangling in the foreground and a novelty item on a table, which pokes fun at and legitimizes two of the more ridiculous elements of Alien. Another one of my favorites, and one of the funniest and least subtle, is Weaver parading around in her underwear two times. We see a robot-like creature cutting through the main door of the Narcissus, and already-only a minute or two into the film-we are expecting to see aliens jumping out of the woodwork, er, steelwork. That's partially due to what Alien did right, but Cameron gets the credit for directing Aliens in a way that gives it tension from the get-go and never stops. Ripley's ship didn't head back to Earth, and she isn't rescued for 57 years because it took that long for another ship to notice the Narcissus. Once she's rescued, we see her experience psychological trauma from her ordeal (of course, to her it was just a day or so ago) and incredibly, get drilled by her employers about the events and the loss of a multi-million-dollar ship. This is a good idea, and is perhaps a more profound societal commentary than the facts underlying (underwriting?) the events of the first film. Ripley learns that a number of colonists, or "terraformers," have settled on the planet where her crew first encountered the alien, and when one of her employers sends out a small party to check out Ripley's story, Earth shortly loses contact with the planet. They decide to send "space marines" to check out what happened, and after some manipulation, Ripley decides to return for her own reasons. It's a great premise and enables Cameron to add another genre to Alien's combination of science fiction and horror, namely action. Aliens is still a 1950's-styled monster movie at heart, but the genre-bending works to its advantage, and Cameron has created one of the best sequels to a well-liked film in any genre. Michael Biehn gets bitten - something that happens to him in every Cameron film he's in. Submitted by Chris (not verified) on Tue, 2011-07-26 17:30. Very astute review. And you're spot on with your observations of how Cameron leverages the legacy of Scott's work to maximum effect without aping it. It's another example of how well versed in the craft of film making Cameron was even at this early stage in his career. If he's had one weakness though it's his inability to edit his own work. The special edition adds about 20 minutes or so of absolutely unnecessary footage. I didn't need to see Ripley mourning her daughter's death to know later that Newt tweaked her motherly instincts. That scene just bogged things down. Ditto for including Newts family discovering the nest after Burke sends his message. This whole matter was covered in 10 seconds of dialogue between Ripley and Burke in the orginal. I'm glad the box set includes the theatrical version. I was beginning to think it would get completely lost in time when it is, IMHO the definitive version of this masterpiece. Thanks again. Great post. Submitted by Nate Yapp on Tue, 2011-07-26 17:59. I just saw the Theatrical Cut at the New Beverly a week and a half ago. The only thing I really missed was the scene with the automated sentries. I remembered watching it in the Director's Cut and loved how it added to the "Well, crap" atmosphere. I was a bit disappointed to learn that it wasn't in the Theatrical Cut. Otherwise, though, the theatrical cut is lean, mean, and exactly what is called for. Submitted by n0_c0mm3nt* (not verified) on Thu, 2011-09-29 16:13. Submitted by Vin (not verified) on Fri, 2013-04-12 15:27. When Aliens first came out in May 1986, it was a great movie - I saw it 3 times in two weeks. However, when it was broadcast by CBS in 1991, they added some of that extra footage. Those automatics sentries that were not in the first film were very good and exciting and they added a tiny bit of continuity. However, more so, was the early scene when Ripley is waiting in the lobby for Burke before The Company's interrogation meeting. In that scene, we learn that Ellen Ripley was a mother who had a daughter whom Ripley had promised she would be home for her 11th birthday. Ripley learns from Burke that her daughter had recently died at age 68. Ripley's devestation and our learning of her motherhood give her character considerably more depth and reason to be protective of Newt. Even Roger Ebert mentioned this in one of his books - how this scene changed his view of the film significantly. I want to be clear also - this scene of Burke and Ripley about Ripley's daughter and our knowledge of that daughter were nonexistent in the original film which is why Ebert changed his mind.